Chess is an iconic tabletop game, a game of pure strategy and planning that pits two players against each other on a battlefield with nothing but their wits to save them. It's difficult to imagine how you could improve upon the classic game, but designer Felix Albers set out to do exactly that with Paco Ŝako. 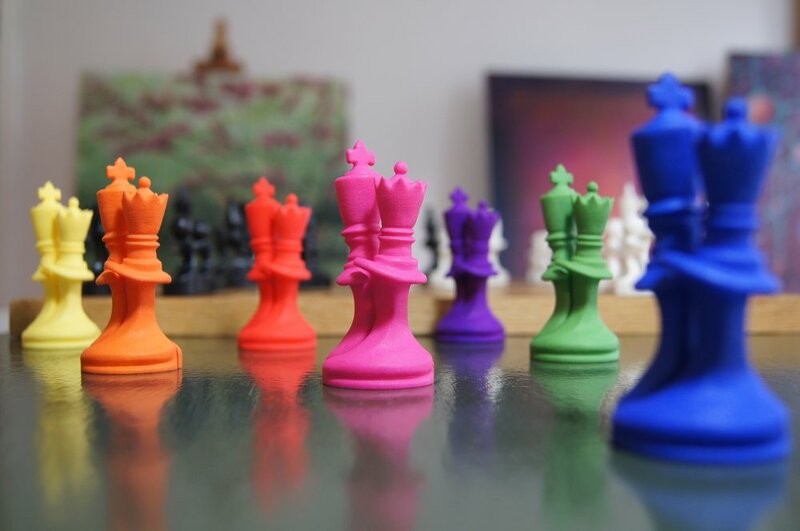 This twist on the familiar game of chess is designed to be an expression of peace, friendship, and collaboration, while also creating uniquely challenging gameplay that forces you to reconsider the core strategies of the original game. Tell us a bit about who you are! As all my time goes into Paco Ŝako, art and my young family I don’t currently play anything other than Paco Ŝako. I also do this to further develop my skills and understand the depth of the game. I make jigsaw puzzles with my son, but he’s too young for board games. That said, he plays a lot with the Paco Ŝako pieces, just putting them all together. As a child, I played different board games, but I guess chess was the most interesting for me. The strategic aspect of the game and making your brain work was satisfying. It always interested me, although over time I lost the connection with chess. Tell us about Paco Ŝako and how it plays! Paco Ŝako is not difficult to learn, especially when you know the basics of chess, though when going into the depth of the game you’ll start to understand its ingenious beauty. I believe it holds a very interesting, creative and stimulating gameplay, but you might have to get yourself familiarised with it to get the feeling for this. When you start to understand the combinations which you can make with the chain reactions, it’s mind-blowing. Paco Ŝako has the same pieces as a traditional chess set. The main difference however is that Paco Ŝako pieces can form unions with the pieces of the other player. Black and white pieces can embrace each other and share one field. This means pieces are not ‘taken’ and all pieces remain on the board throughout the game. This results in a game which becomes ever more dynamic and creative. It can gain momentum and create sometimes very surprising and cool winning moves. What kind of strategies does the game allow over regular chess? If I were to mention one specific thing, it’s the chain reaction and the fact that you can move several pieces within one move by making combinations with your pieces which are connected. When the game develops, these options will increase. This means besides thinking ahead, there is also “seeing” ahead, because these combinations are often laid out on the board, but you must spot them. This gives another layer to the game, which on the one hand makes the game more accessible, but at the same time can make games incredibly ingenious and creative. Starting to see these chains and understand the different combinations feels like thinking in a new dimension. Besides that, there are some changes in how it feels to play. You can play quite freely in the search for creative options, because you don’t lose pieces. You can basically play your pieces to wherever you like and don’t have to be afraid of losing them. It invites playing forward and sometimes accelerates games. Of course, you can still make a bad or good move. Positions in the game can shift more during play, which gives it a more surprising and creative character. Additionally, there are some new tricks you can use in search of the final embrace of the king. Having a child and becoming a father was the main inspiration. My wife was pregnant and I had an overwhelming feeling of the responsibilities of becoming a father. I thought about how I would tell my son about life. How would I explain to him how things work in this world and why things are created or exist in the way they do? It even worried me to think about breaking the news and telling him what’s going on in the world. Besides this I thought about some of the practical things I wanted to teach him in life. Like soccer, riding a bike and playing chess. Chess was maybe for me the most specific one, because it could be good for his development, is often used as metaphor for life and used in education. Somehow though, something about this didn’t feel quite right to me. With that I believed and felt I could tell him something different about the world through chess. What values do you believe the game imparts for children? Sometimes I give away a couple of pieces to a child. When a child walks away with two Paco Ŝako pieces and you see him or her smiling and creating the embrace, you see the meaning of the game. It’s a friendly and meaningful gesture and kids love to make the embraces, without even playing or knowing the game. It’s basically about love, friendship and collaboration between two sides and not about elimination, conflict and war. When two sides with possibly different ideas, skills, perceptions, background or values meet with an open mind, the willingness to learn from each other, talk freely and create and develop together, people can find a way to peace, friendship, harmony and the creation of something positive by merging their strengths. Doing this is a road or a process, which is what the game displays. These journeys do not always have to be easy and not all input has to be accepted straight away. You should stand up for your ideas whilst understanding that processes might not always go smoothly or the way you’d like and the fact that you must learn to appreciate constructive input from the other side, is all part of the game of living, working and creating together. It’s very clear that you value yourself as both an artist and a philosopher - could you describe the process of synergizing a creative expression, a solid game, and a philosophical statement all in one? My artistic expressions and goals in life have always focused on humanity, existence, perception, creation, thinking, conflict, love and pain. Looking at the chessboard, knowing what it represents in its most basic form, it does not appeal to me. I do appreciate and admire the beauty of the strategic gameplay and admire its historic position, but for me it lacked a more considered, kind and thoughtful character. Seeing and feeing the role chess had played and plays in the world and at the same time being focused on it, it felt like this globally much-admired mind game, could also be about something different. It’s an intriguing thought, that mankind’s most widespread, known and admired mind game is about elimination and war. Somehow it feels like it does not add up, because chess feels so much connected to life. Two sides who both think very deeply must know that eliminating each other is not the way to go. With that Paco Ŝako tries to challenge the idea of how we perceive human nature and more specifically our “natural” acceptance and instinct to engage in conflict. Although it’s a game, it represents a different state of being. At the same time, I realised that changing the soul of chess, by creating an embrace between the two sides, would maybe make a “nice” artwork, but would really become valuable if I could create a gameplay which would be ingenious, fun and would certainly be as fun as chess. This is where the challenge began to translate a “nice” thought into a functional game. If it were successful, this could carry the expression of and thoughts behind Paco Ŝako far into the world and into the homes of people. Besides just being a fun game, it could also maybe be used as an expression to talk and tell of living, working and creating together in this world. It took a while to develop the gameplay, but I and others believe it has become a rather riveting game. This is reflected not only in the spirit but also through the lively gameplay. Naturally you must first spend some time familiarizing yourself with the gameplay and feeling of the game but once you’ve done that it’s very worthwhile. The design of the pieces themselves are gorgeous - tell us about how they came to be. Obviously, the thought of letting the chess pieces embrace was the leading characteristic of the design and with this I deliberately choose to stay as close as possible to the design of the commonly known chess pieces. The arms originated out of the rings under the heads of most of the pieces. These rings lent themselves to being open and being turned into the little arms. 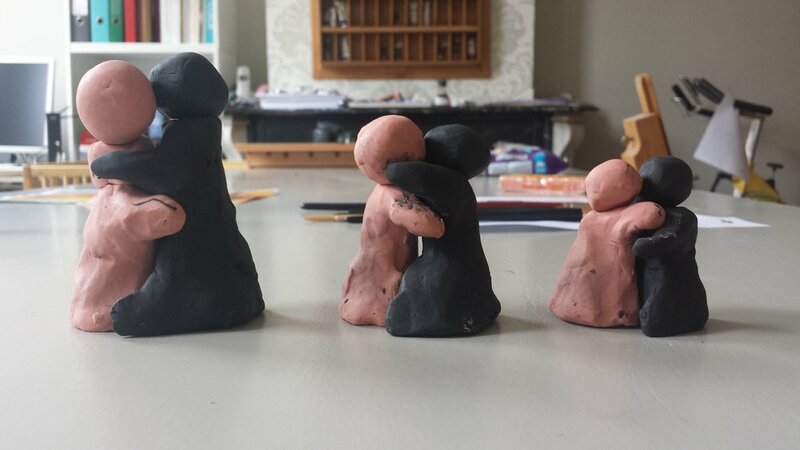 The challenge was the mechanics of the embrace and how to make it visually look natural at different heights. 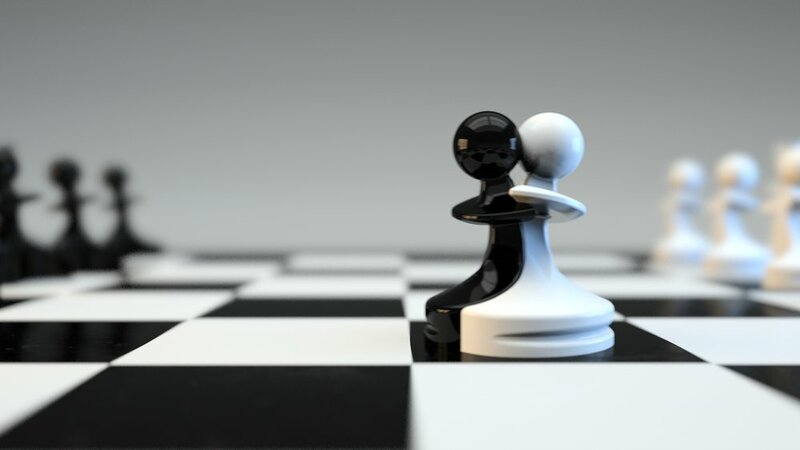 Pawns would embrace each other at a low level, knights, rooks and bishops at a middle level and kings and queens at a high level. The foot had to be created and I decided to create a shape which would give balance and make merging pieces easy. This led to the design of half a Yin Yang symbol on which the center of gravity stands on the inside of a half. It was nice to see that this search for functional balance led to the Yin Yang sign and that the chess pieces basically rise-up out of this symbol. Then my challenge was to make a lively swung/swirl/twist in the pieces as if they would twist around one other, like in a dance. An organic shape which would express energy and liveliness. 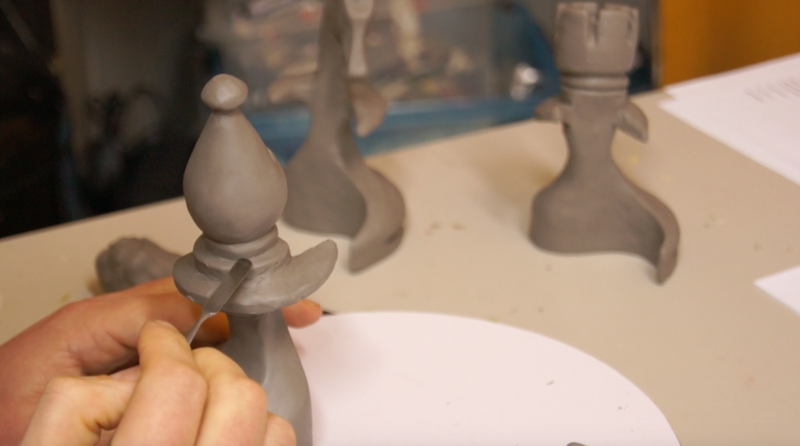 All this required some fine-tuning and after drawing and testing, I decided to sculpt the six chess pieces out of clay. After this they were scanned into a computer and eventually adjusted for production molds. In future, I will also make miniature symbolic statuettes of the pieces in addition to the game itself. What does Paco Ŝako mean? Where does the name come from? Paco Ŝako literally means Peace Chess translated from Esperanto. My father taught me about Esperanto. As you may know, it‘s an artificially constructed unified international language which was developed to enable people from all over the world to communicate with each other. It was created to take down the boundaries of miscommunication and unite people through common language. You possess a detailed vision for your “The Moment Of Life” project (with Paco Ŝako being a part of that) - what’s next for you? I can’t say too much about it for the time being, except that it’s a social media concept/tool for a better world. I hope to start developing this in the coming year and meet like-minded and knowledgeable people to get it up and running. To find out more about Paco Ŝako, or to order your own copy, you can head over to the game's website. As well as the traditional black and white sets, you can now purchase half sets of coloured pieces, so you can mix and match the two sides in any colours you like.